This Combo features a 6' 2-Pc. medium Z-Glass rod and the classic Zebco 33 spincast reel that's a favorite with rookies and seasoned anglers! Ball bearing drive system for smooth reeling; Right or left retrieve; Front adjustable drag control; Selective anti-reverse for confident hooksets; Medium action. Zebco 202 Spincast Combo. Ideal for medium freshwater fishing, the Zebco 202 spincast reel has all metal gears, adjustable drag and an on / off reverse. It's matched with a 5'6" Zebco rod. More details on the 202 spincast reel: Tough ABS housing; Positive Pickup; 2.8:1 gear ratio; Star-adjustable drag; Built-in hook keeper; Chrome-plated cover; Pre-spooled with 10-lb. line. Ideal for medium freshwater fishing, the Zebco 404 Spincast Combo comes ready to fish right out of the box with the Zebco 404 spincast reel, a 5-foot, 6-inch rod. Zebco 404 reel boasts all metal gears, stainless steel pickup pins, a star-adjustable drag for confident hooksets, and a Built-in Hook Keeper. Thanks to tough ABS housing and a dual paddle steel crank handle, the reel is ready for years of use. The reel comes pre-spooled with 15-pound monofilament line and is paired with a medium action Z-Glass rod with a comfortable EVA grip. 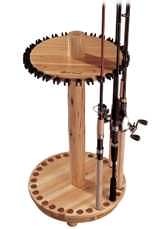 Need a place to hide your fishing equipment? 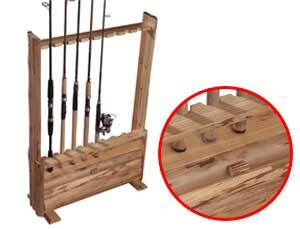 This beautiful and functional rack stores up to 8 rods and provides ample storage space along the bottom for additional gear. Optional feet (included) can be attached to transform the rack from wall-mounted to freestanding. 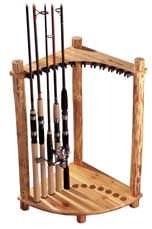 This hand-finished rack holds up to 16 rod/reel combinations of any size or style, and the rack features easy-rolling casters so you can move it from room to room with ease. 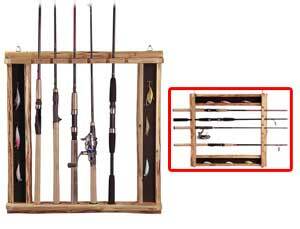 This decorative yet highly functional rod holder allows you to store your favorite lures along with up to 6 rod and reel combinations. It can be used for both horizontal and vertical storage by adding or subtracting the caps (supplied). 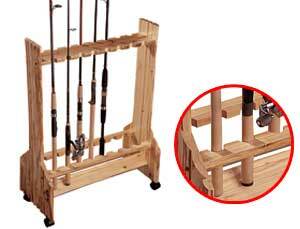 This Spinning Rod Rack stores up to 30 fishing rods securely and easily. This rack rotates 360 degrees, making it perfect for use in corners or other limited spaces. And with this handcrafted design, it is perfect for any home or cabin. 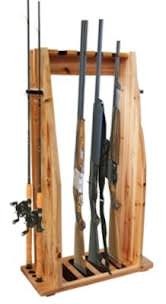 Store up to 12 fishing rods in any corner of your home with the space-saving Corner Rod Rack. 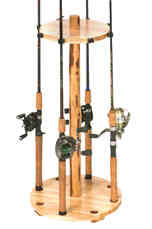 This rack holds both spinning and casting rods. Hang or nail the Catch-O-Matic to at tree or post. To set, attach hook and bait of choice (not included) to snap swivel. Pull line to desired length and set trigger notch of reel.